Prayer: Lord God, Creator of the human race, your Son, through the working of the Holy Spirit, was born of a woman, so that He might pay the age-old debt of sin and save us by His redemption. 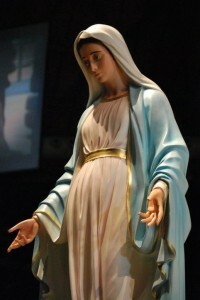 Receive with kindness the prayer of your servant as she asks for the birth of a healthy child. Grant that she may safely deliverer a son or daughter to serve you in all things, and to gain eternal life. We ask this through Christ the Lord.